Kina Collins is a gun violence prevention and criminal justice reform advocate. She is also a native of the Austin community on Chicago’s west side. She began her activism during her time as a student of Chicago Public Schools, where she served as a Summer of Service Learning Ambassador and continued her mentoring efforts throughout her collegiate career. She attended Louisiana State University studying Sociology. During her time at LSU, Ms. Collins was inducted as a Ronald E. McNair Research scholar and a member of Delta Sigma Theta Sorority, Inc.
Ms. Collins would go on to be selected as a National Leadership Council regional organizer for gun violence prevention and criminal justice reform through Generation Progress “Fight for a Future” network, representing the state of Louisiana. 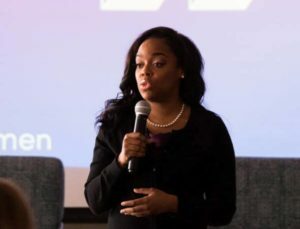 As the Louisiana regional organizer, Ms. Collins was apart of the “Beyond the Gun” campaign, where she helped launch two national campaigns around the 2016 Presidential election. Currently, Ms. Collins serves as the founder of the Chicago Neighborhood Alliance, a coalition-building organization centered on empowering activists and organizers around the reduction of gun violence in the city of Chicago. Ms. Collins was selected as a feature in 100 Black Women of Chicago, honoring her dedication to community service and leadership. She recently co-authored her first bill that was passed into law, the Illinois Council on Women and Girls Act. Ms. Collins serves on several boards including, Women’s March- Illinois chapter, Chicago International Peace Movement, and I Grow Chicago. Currently, she serves as the Chairwoman for the Illinois State Council on Women and Girls. Register now to honor Kina Collins at our Annual Women Who Dared cocktail reception and fundraiser on Wednesday, October 3, 2018 at 6 PM.